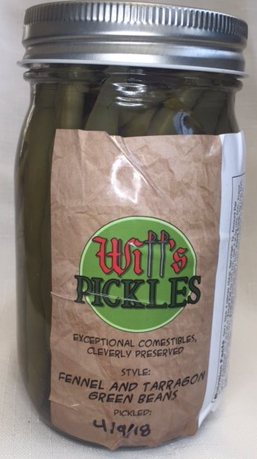 Each jar of Witt's Pickles is handcrafted from locally sourced, organic produce and preserved in a unique brine cleverly designed to elevate and accentuate the natural flavors of the vegetables. Shredded fennel bulbs pickled in orange juice and vinegar, and flavored with orange rind. Our shredded fennel adds a pleasant floral and citrus note when used as a garnish. Add it to salads straight from the jar or sauté it and serve with pork, fish, or a variety of hearty cooked vegetables. These Mediterranean inspired zucchini pickles are fresh, herbaceous, and delightfully versatile. With fresh basil and thyme, and red wine vinegar, toss them into a Caesar or pasta salad, add them to sandwiches, sauté them with olive oil, or add them to a charcuterie plate. Golden beets, local honey, bright fresh lemon juice; these beets are everything we wished pickled beets could have been as kids. They make a delicious addition to a salad, or snack on them, and add them to veggie sandwiches. Our beautiful green beans are pickled with cider vinegar, and flavored with fennel and tarragon. These green beans add a wonderful anise note that pairs well with fish, poultry, and pork. They’re great for snacks and salads, and perfect for a Bloody Mary. Bursting with Fall flavors, these apples are flavored with cinnamon, clove, ginger, and a hint of honey and citrus for a perfect blend of cider and pumpkin spice. Extremely snackable, and just as delicious with pork chops and with a bowl of vanilla ice creams. Our onions are flavored with brown sugar, red wine vinegar, and toasted cumin seeds, alongside plenty of garlic. These onions scream barbecue. Toss them on a burger, or any sandwich to add a wonderful sweet, earthy flavor. Sweet onions seasoned with cilantro and lime and spiced up with a little Baby Clydesdale Sriracha. They're herbal and sour with just a hint of spice. Perfect for tacos, burgers, and all sorts of southeast Asian cuisine. Fresh summer watermelon, pickled with mint and rice wine vinegar. Sweet, sour, refreshing, and just the thing for a hot summer day. These pickles add a bright note to any salad, and make for great snacks. Find us at farmers markets and artisan fairs in San Diego County. Delivery available in the greater San Diego area. Order via email or select local options in our shop.